Making a replacement neck for the first Martin 12 string. We work on all acoustic guitar, mandolin, banjo and violin family instruments, old or new, with a particular emphasis on 19th and early 20th century American steel string guitars (including Martin, Gibson, Washburn, Regal, Stella, Weisenborn, Euphonon, Weymann and Larsen Bros.), flamenco guitars, and double basses. We are happy to do minor set-up and adjustment, general repair, or major restoration. 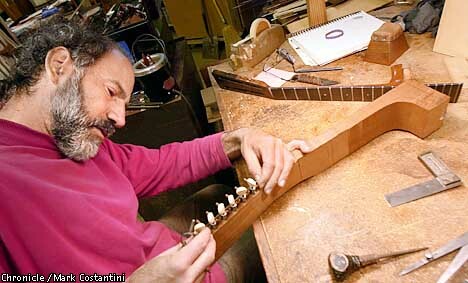 We have the technical capacity to make “forgery grade” reproduction parts, such as Martin pyramid style bridges, for your vintage instrument, as well as access to all modern manufactured guitar and violin family parts such as bridges, fingerboards, tailpieces and pegs, and pick-ups from most popular manufacturers. Most minor repairs, such as fret mills and bridge reglues, and action adjustments can be turned around within a week. A written estimate is given when your instrument is left for repair. All repair work is unconditionally guaranteed for a year unless otherwise noted, and some work for as long as you own the instrument. My 45 years experience in working with dealers, collectors, working musicians and serious amateurs informs my approach to repair and adjustment work; my work on older instruments adheres to strict modern standards of conservation (appropriate glues and varnishes, careful removal of old parts which must be replaced and no irreversable repairs or modifications) and “correctness”. Any elaborate repair or restoration work on your instrument will be preceded by a conversation which will consider your intention for the instrument, the market, conservation issues, your budget, and most importantly, what's best for the instrument. We use hide glue almost exclusively. It's strong, non-toxic, easy to retouch over, and has stood the test of time— I have examined instruments over 150 years old constructed with hide glues and found their glue joints intact. And it's reversible. (My work with 19th C. instruments has taught me that it's pure hubris to think that I would be the last one to work on a given instrument.) Likewise I use mainly shellac dissolved in alcohol (spirit varnish) and natural pigments for retouching. This material, applied with a pad (French Polishing) is also what I use to finish my new instruments. We strive for “organic” repair and restoration work— in harmony with the rest of the instrument, and respectful of both the intentions of the maker and the laws of physics. Berkeley Musical Instrument Exchange, Berkeley, Ca.